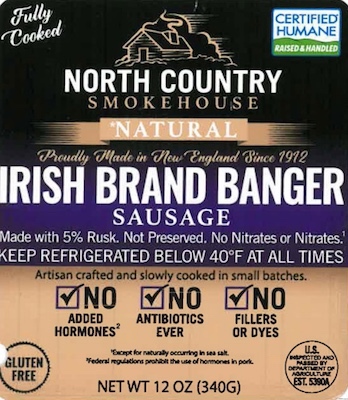 North Country Smokehouse Natural Irish branded Banger Sausage, sold in 12-ounce vacuum-sealed packages, each containing four (4) pieces with use-by dates ranging from 3/30/19 through 4/30/2019. Please consult the photograph above for details of the food’s packaging, design and retail presentation. One (1) additional image of the recalled Banger Sausage products can be found on the Web site above. According to the USDA, he products subject to recall bear establishment number “EST. 5390A” inside the USDA mark of inspection. These items were shipped to distribution and retail locations nationwide. The problem was discovered on March 11, 2019 when the firm notified the US Department of Agriculture’s Food Safety and Inspection Service (“FSIS”) that they received a consumer complaint. ==> For information about Wheat Allergy or Gluten Intolerance, please consult the “Allergens & Intolerances” tab on this site, located at the top of this page. If you believe you have purchased or have in your possession any of these recalled Banger Sausage products and could be allergic to their Gluten (Wheat) ingredients, have a close family member who is allergic or has previously experienced Anaphylaxis or are unsure of your allergy status, please do not consume them. Instead, return the product to the distributor or wholesaler where you purchased it for a full refund. ==> If you have a medical emergency, please contact 9-1-1, your closest hospital or emergency center equipped to handle Anaphylaxis. ==> To see other recalls and notifications caused by contaminated, adulterated or mislabeled Banger Sausages, please search for “sausage” or using the Search Box at the top of this page. If you have any questions about this recall notification, please contact Ms. Alicia Baker, Brand Manager for North Country Smokehouse at 1-603-543-0234, extension 214 during normal business hours, Eastern Standard Time, Monday to Friday. ==> To see other recalls and notifications caused by undeclared Barley, please search for “barley” using the Search Box at the top of this page. ==> To see other recalls and notifications for products manufactured, marketed and/or sold by North Country Smokehouse, please search for “North Country” using the Search Box at the top of this page.